Cette maison a une vue imprenable sur la baie et la ville. C'est élégant et spacieux. La literie, les ustensiles de cuisine et les meubles sont pour la plupart neufs. Doonas et oreillers sont fournis. Il suffit d'apporter vos propres serviettes et draps. Les serviettes et le linge de lit peuvent être fournis moyennant des frais supplémentaires. Détendez-vous sur le pont et observez le ferry de Portarlington et les bateaux qui y naviguent. Il y a un grand balcon / terrasse avec barbecue, et une nouvelle table à manger en plein air et une suite lounge pour se détendre et se divertir. Un poêle à bois pour l'hiver. We all had a great time . house was lovely ,would stay there again everything we needed & the ocean just across the road . Perfect location, perfect house as described. 5 out of 5. Great house so close to the water, views were unreal. Easy walk into town. House was clean and tidy, comfy beds. We couldn’t ask for a better experience. The house had everything needed for a relaxing holiday. Movies and games were appreciated. Beautiful sea views, quiet location and close to town center. The only negative was that the cooking pots, frypan, etc. needed cleaning before we could use them. 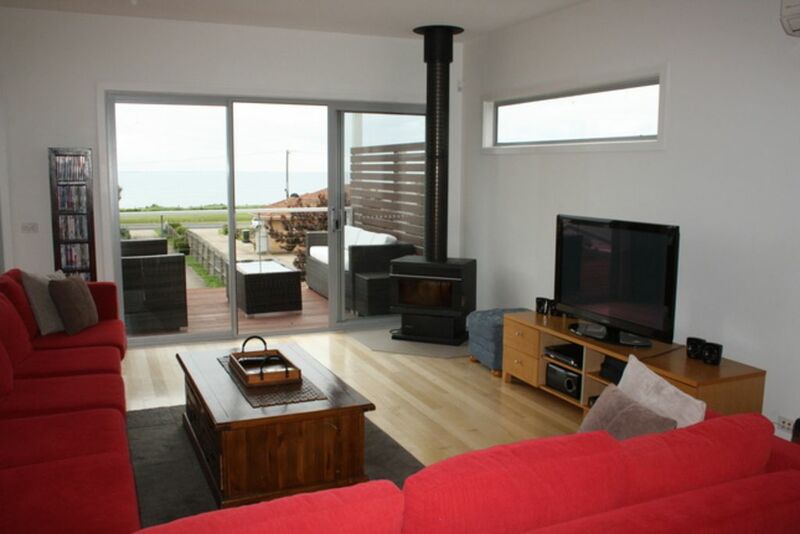 Large accommodation with open plan layout extending to outdoor living with bay views. So relaxing, clean and close to beach and shops. Will be back ! Spacious, very clean, very tidy, everything that we needed, perfect location, absolutely lovely. This was our fourth annual stay in the area, and the best with many thanks to Effie for allowing us to stay at her lovely beachside home. The location is absolutely perfect. It's not right on the beach, because it sits behind another house, but the driveway that the two properties share means that there is an unobstructed view to the bay and, on a clear day, to Melbourne beyond. It is just so calming to look outside from anywhere on the top level and see the ocean. So you get beach views, without having passers by walking close to your windows, which I don't like too much - there is privacy at the same time as feeling as though you could almost touch the beach. And it is 1.4km to get to coffee on the main street (a perfect run up the hills to the town), Woolies, the bakery or if you are lucky the donut van by the pier (possibly the best jam donuts in the world). The house is perfect for one or two families - while we were there with our two girls, there is room for another couple and two children, as there are two double beds and four beds in bunks in a separate room. It's well set out with the bedrooms and two bathrooms downstairs, and upstairs is a large kitchen with everything you need to cook (and we are pretty fussy), and as it is open plan you can prepare dinner and chat with everyone in the lounge are and look out to the ocean. Next to the lounge is the dining room where we had to do a bit of work (wifi is great), but it's not so bad with that view (honestly). And behind the dining room is little tv room that my kids used to watch dvds and which my husband hooked his nintendo up to (I think - I'm hopeless with that stuff - SuperMario or something?). And there's a toilet upstairs too (handy). It's very clean and well kept. It's not dusty or grubby inside, and it's not full of stuff either; it was easy for us to unpack our belongings and leave them where they would normally belong at home, so that it felt like home for a week, because there was room for us to live there; it wasn't cluttered. We had a real feeling of space there. That said, the owners have left good magazines on one bookshelf, and good books in the tv room, and I think that there were DVDs too (but we didn't have time to watch them). And Portarlington is such a well kept secret. It's sweet and homey, and a short drive to Ocean Grove and Queenscliff and Torquay and even Bells Beach. And we catch the ferry to Melbourne for a day trip from the pier. It's perfect. We had a wonderful time staying here with our three young children. We loved the outlook from the balcony, and there was plenty of grass for the kids to run around, and plenty of room inside to play as well. We also enjoyed the large selection of DVDs! House was clean and comfortable, and Effie was wonderful to deal with. Would definitely stay here again!